Special Seasonal Offer for Mother's Day 2019!!! A beautiful bouquet of mixed coloured tulips tied and arranged in a glass vase. You can be certain that this bouquet will delight any mum when she receives her flowers. We hand deliver our flowers and never use couriers to ensure the best possible care is taken to deliver your flowers, if we have to leave them with a neighbour or somewhere safe we always leave a calling card and a follow up phone call if we are given a phone number. The bright colours of these flowers with the colourful wrapping and bag is sure to make this Mother's day one to remember! We are proud to be able to use British grown tulips this year for this bouquet ensuring the best quality available. 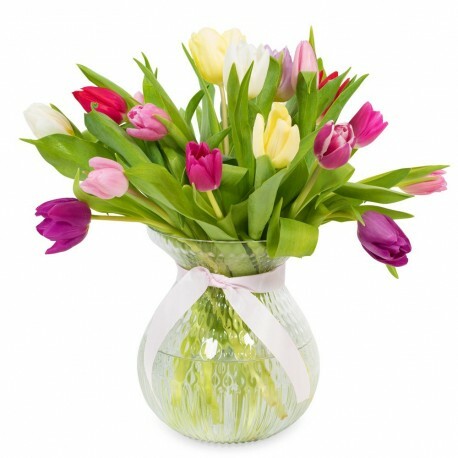 Your bouquet of stunning Tulips will arraive with your personal hand written card message, a bow and flower food. Deliveries are being taken for Friday, Saturday and Sunday for a mothering weekend delivery.